A few weeks ago I made pesto. Rather a lot of it. I love pesto, well I do now having redicovered the joy of making it from fresh, homegrown basil. And I really liked eating it in this vegetarian chickpea dish. This recipe comes from Trevor who blogs at Baby Hickman. “It is just a hotch-potch, not really a recipe,” he says. But I think it is nice combination, worthy of being recorded as a recipe. 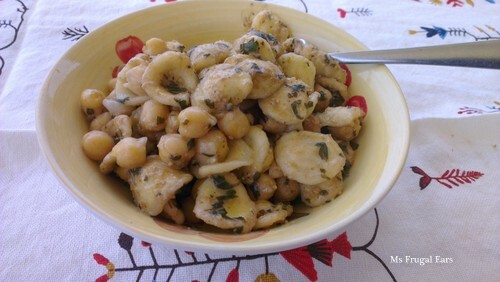 It is not so usual in Australia to combine chickpeas with pasta, but it is much more usual to do so in Italian cuisine. It adds some protein to the dish, which is especially important for vegetarians. But of course, you don’t have to be a vegetarian to enjoy this pasta. Prepare the chickpeas. (You can buy them in a can, but I am a bit of a frugal traditionalist and prefer to make my own.) Soak them overnight in water, adding a pinch of bicarbonate of soda to soften the water. Tip the water out and change new water, then boil for around 20 to 30 minutes until soft. Cook the orecchiette pasta until al dente. I find that a good orecchiette pasta takes quite a lot of time – at least 15 minutes – so be patient. Drain and reserve a little bit of cooking water in case needed. 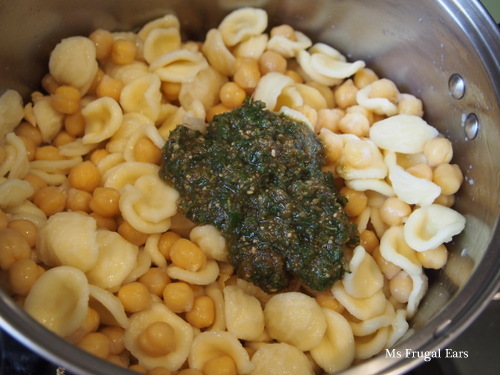 In a large bowl or saucepan, combine the hot pasta, chickpeas and pesto. Stir through until combined. Serve hot. You can top with a few toasted pinenuts and/or fresh basil if desired. I love chickpeas! can’t get enough it. Great way to make an original pasta that has protein. Will try it out. I love chickpeas, too. I find that people are either a fan – or they are not. Your pesto looks fantastic. We often make too much then use an ice tray to freeze it in cubes, then you have some on hand when you need it for flavor. Thanks for this tip. I plan to make an extra large batch over the weekend and will try freezing it. 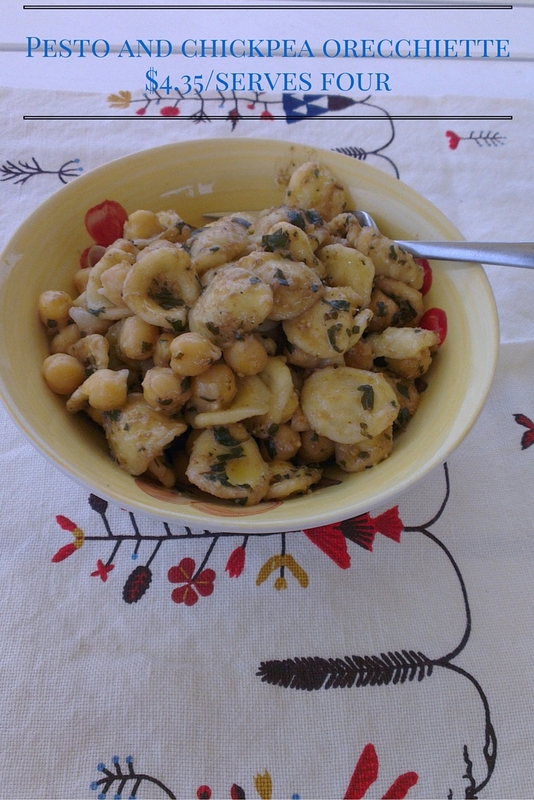 Ah, another person who likes to mix chickpeas (garbanzo) with pasta. It is really a lovely combination, or at least I think so. Oh my goodness… Just oh my goodness. You always share the best recipes. I swear 1/2 of my May meal plan are your recipes! Pesto is one of my favorites too. It’s surprising how much basil goes into the traditional recipes. You must have a good sized garden! What a beauty… Love the simplicity of this dish and that I can make it for lunch today. I have just one more large post of basil to turn into pesto and I can officially turn my garden off for the winter. Thanks love. I’m desperately making more pesto as well. Thankfully we have had a good run of warm weather to end of April, but it is bound to finish soon. You really know how to make the most out of anything! Great recipe again! Ha ha, yes I don’t waste much! I never knew pesto would go well with chickpeas… Joseph would love it. Thanks for sharing! Definitely deserves to be called a recipe! Makes for a more original meal. It also helps that it’s simple and affordable.